POSADAS, Sr., John Z. February 12, 1921 - December 25, 2016 Our beloved father and grandfather, John Z. Posadas Sr., 95, peacefully passed away in his home on December 25, 2016. He spent all of Christmas day with his adoring family before taking his last breath shortly before midnight. John was born in Guatemala in 1921 and arrived to the United States in 1938. He was a resident of San Francisco for more than 75 years and was a resident of Rohnert Park for the past nine years. A true outdoorsman, he spent many summers and winters in South Lake Tahoe, but loved nothing more than just spending time with his family. His smile and grin will forever be missed, but remembered by those he left behind. He married the love of his life, Simona Urrutia in 1942 before enlisting in the army the same year. A veteran of World War II, he was a paratrooper who jumped 22 times and was awarded several medals for his dedication and bravery. He was part of the 82nd airborne division and stormed the beaches of Normandy on D-Day. Following the attack, he went missing in action and presumed dead for more than two years, but returned to his love's doorstep after escaping a POW camp. John is survived by his wife of 75 years and 3 sons; John Jr., Michael, and Greg. He is also survived by his eight grandchildren. He is predeceased by his son, Mario. A viewing will be held on Monday, January 2 from 4 p.m. to 8 p.m. with a rosary at 6 p.m. located at Eggen & Lance Chapel in Santa Rosa. The burial service will take place on Tuesday, January 3 at 11 a.m. located at the Golden Gate National Cemetery in San Bruno. John enlisted in the Army at San Francisco, CA on 16 November 1942. Not yet a U.S. citizen he had been born on a family-owned coffee plantation called EL Cipres (Cypress), County of Samayac (Department of Suchitepequez) Guatemala and was christened as Juan but apparently had already adopted the anglicized version of his name. Pvt Posadas was captured in Normandy on D-Day, 6 June 1944 and held prisoner until he was liberated from Stalag 4F on 5 April 1945. 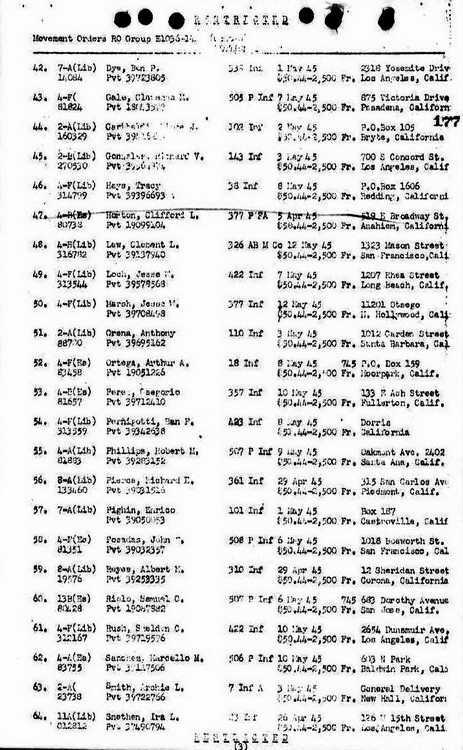 On 12 June 1945 Pvt Posadas arrived in New York City harbor aboard the USAT Admiral Benson (see line 58). 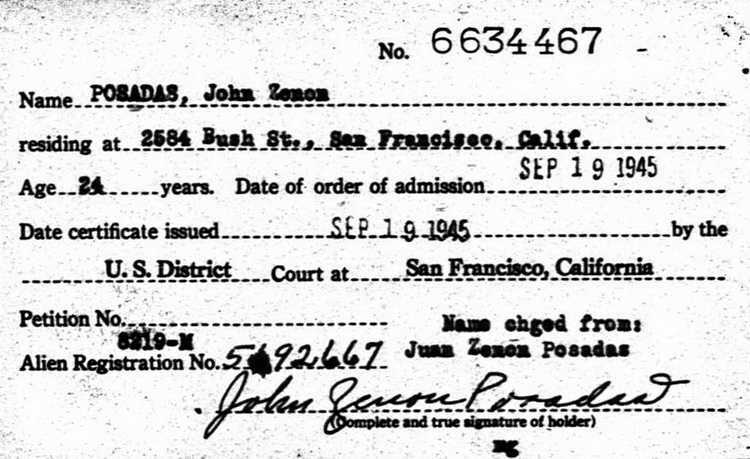 Juan wasted no time in leveraging his service records to attain U.S. citizenship as he was admitted on 19 September 1945 by the U.S. District Court in San Francisco. The newly anointed citizen officially changed his name to John.